Many tourists make a mistake of not taking on the northern part of the West Coast. Often, they would travel as far north as Westport, but leaving out Karamea area. And that’s a mistake as this region is one of marvels the West Coast has on offer. Oparara Valley is famous for its lush green rainforest and beautiful orange-brown tannin stained Oparara River but particularly for its famous limestone arches and caves. One of the easily accessed caves is Moria Gate with Oparara River flowing through it. 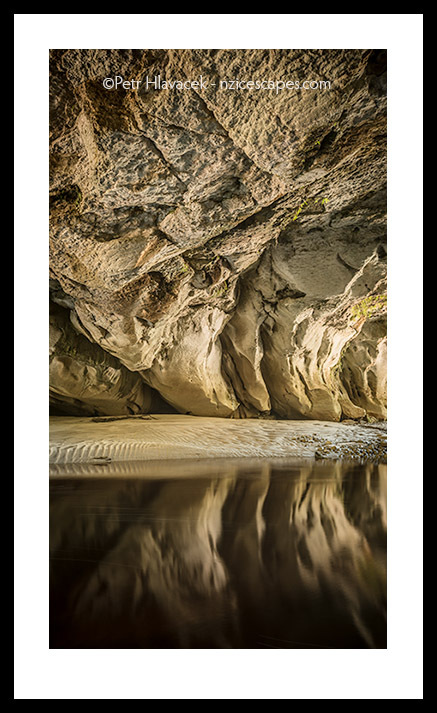 The arch itself offers endless photo opportunities but using slow shutter speed enables us to capture wonderful reflections of the cave shapes reflecting into the slowly flowing river. This is a very easy, short walk from the carpark and everyone visiting this are should come and enjoy tranquility of this wonderful location. Not like in the where sadly, as far as you can see, there is always a pine grove in a view, spoiling these beautiful Sounds. Luckily some great work is being done to eradicate this trees from these hills where they don’t belong. This entry was posted on 20/03/2014. It was filed under Geology, Hiking/Tramping, Photography and was tagged with hiking, Kahurangi NP, native forest, New Zealand, photography, rainforest, river, West Coast.